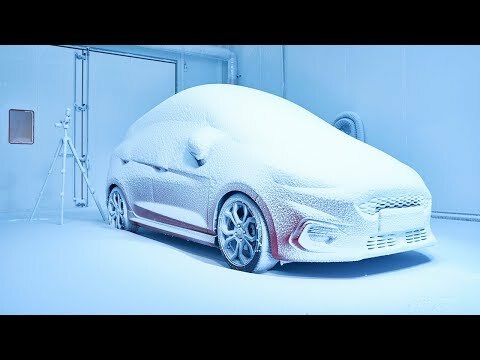 At Ford's weather Factory, there could be Snow in July or a Christmas Heatwave! The new state of the art Environmental Test Centre allows Ford to put all of the world's weather under one roof, this enables engineers to test all vehicles in the most demanding conditions. Like, altitudes as high as Mount Everest North Base Camp, a dizzying 5,200 meters, wind speeds of up to 250km/h, snow storms, glaring sunlight and tropical rain storms. Whatever climate you live in they are only the push of a button away in Europe's most advanced facility of it's kind. On an area the size of a football pitch, engineers can now take vehicles on demanding journeys around the world. The subject of a €70 million investment, the facility has state of the art equipment to simulate any weather condition, with the ability to go from -40 C to 55 C as well and generate 95 per cent humidity. The temperature extremes make the centre in Cologne, Germany, the hottest, coldest and most humid place in Europe, and home to the highest point in Western Europe.